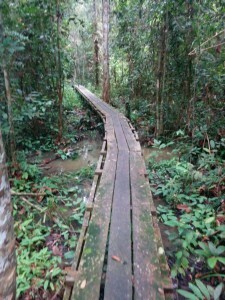 As the rain softly comes down in Central Kalimantan, Indonesian Borneo, it brings with it new life and peace of mind. It is the rainy season in the Indonesian archipelago now, and after months of blistering and smoky forest fires, people breathe a little easier knowing the threat of new flames is some months away. The people of Pasir Panjang, the village on the south coast of Borneo where Orangutan Foundation International’s Care Center and Quarantine is located, go about their days with a spring in their step despite the wetness. Everybody is more rejuvenated and relaxed by the coolness of the rain. 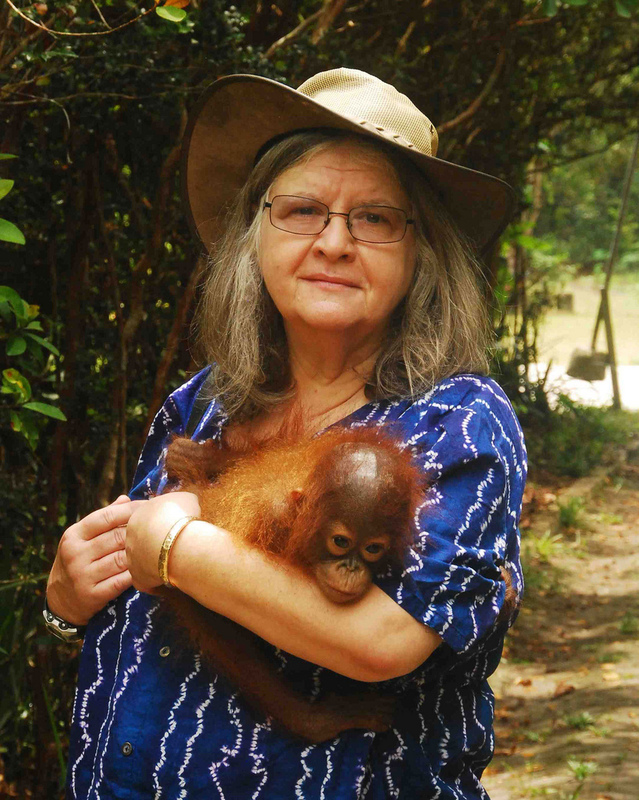 I first arrived in Indonesia to be an OFI volunteer six months ago, in the midst of the fire crisis, and today I am amazed at the change between the two seasons of Borneo. The forest floor that was dry three months ago is now inundated. When I first arrived, I was told that the bridge that goes through the Care Center rehabilitation forest, was built a meter above the ground so as to keep its users dry when the rains came. I was very skeptical and did not believe that the water could possibly reach that high. 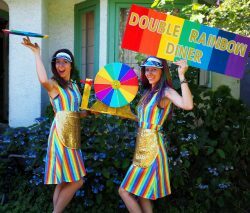 Upon my return in February after having spent a month in Canada, I could hardly contain my surprise at the change. It was drastic! Had I only seen the forest then and not during the dry season, I surely would have thought that the forest grew out of a deeply and permanently flooded plain. 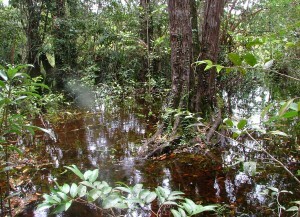 Pale-barked tropical trees rose out of the dark red water, and moisture-loving ferns, sedges, and shrubs grew on every surface on or near the water. 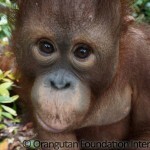 Despite all this, the orangutans at OFI’s Care Center & Quarantine continue to go on their daily release in the forest. Not surprisingly, a few centimeters of water on the ground does not bother such avid and excellent climbers. Almost every afternoon at around 3pm, a blanket of grey clouds draws itself over the tree-tops and a heavy rainfall soon follows. The rain brings a welcomed breeze and a cooling respite from the blazing equatorial sun. The only downside is the redoubled, buzzing activity of mosquitos. Sitting on the porch of my homestay after energetically applying mosquito repellant, the weather provides the perfect setting to reflect on my time so far as an OFI volunteer. The past months have been very busy for all of us at OFI. 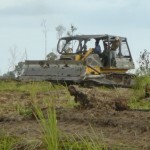 The horrible fires have considerably reduced the forest homes of many orangutans which, in turn, has made finding food very difficult for them. Many of these starving orangutans have resorted to eating fruits cultivated by nearby villagers which has led to human-wildlife conflicts. 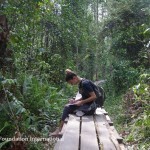 The result was an increase by villagers requesting our help in translocating orangutans. 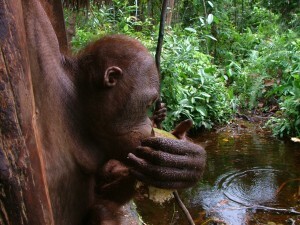 Our skilled Rescue and Release team has done several translocations over the course of the months I spent in Indonesia. I have personally never been to any of the villages to get the orangutans; more people present would have meant more stress for the shy orangutans. However, I was lucky enough to witness some of the releases.. Seeing the orangutans take off, vertically, into the canopy of the forest was very rewarding and reinforced my desire to protect more forest for them. Sadly, the fires have also created many orphans. In addition to the ones who fell victim to the illegal pet trade, several infant orangutans lost their mothers to the flames. Sadly, the fires have also created many orphans. In addition to the ones who fell victim to the illegal pet trade, several infant orangutans lost their mothers to the flames. Some were brought to OFI’s Care Centre and Quarantine, rescued from a sure death by kind and thoughtful locals. These tiny, frightened, orange newcomers were introduced to their loving, capable caregivers and their condition improved considerably after only a few weeks. For some, the change was incredible. From weak and malnourished infants, they turned into plump and happy babies, climbing expertly only a month or two later. 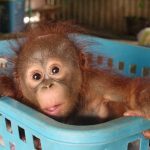 A lot of Orangutan Foundation International’s work is about preparing orangutan orphans to be independent so they can be released back into the wild They learn how to forage and build nests with the help of OFI’s staff. Learning to be wild takes years of hard work for the young orangutans until they get it right.. But it is worthwhile work that is rewarded with the greatest prize of all: seeing released orangutans thrive in their native rainforest. Over the course of the months I was there, we released 10 orangutans at our different camps in Central Kalimantan. At first a little puzzled, released orangutans all quickly got their bearings and began climbing, whether onto the feeding platforms or into nearby trees. Some stuck around the release site for a few days, slowly acclimating to their new environment. Others were instantly at ease, almost as if they had never left their beloved forest, and left soon after release. It is always a little emotional to see an orangutan go, but we are only happy and proud, much like parents at a college graduation. Others left but periodically came back. In my first few months, I was privileged to see all the stages of care given to the orangutans at OFI’s Care Center and Quarantine: from arrival, to rehabilitation, and to their ultimate release back into the wild. I was able to see how they slowly grew more independent as they grew older by observing orangutans from different age groups. With the help of all our supporters, big and small, we are able to get the word out and achieve this very important work. The ultimate hope is to allow these majestic great apes to continue playing their role in their ancient rainforest home, and for future generations of people to have the chance to be amazed and inspired by them.